Generally mid-week I start to plan for all the crap I’m going to cook and eat on the weekend, then I feel guilty and cook something healthy. This is a great light sauce that can be used on anything, but I particularly love the mild flavors with fish. 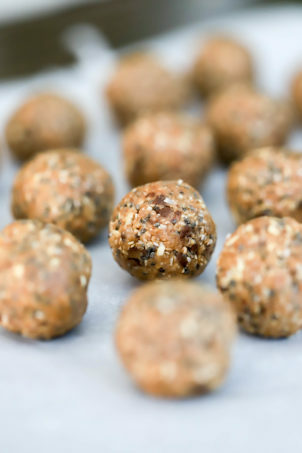 If you don’t like fish you’re silly and missing out, but you could easily make this with any other protein of your choosing (not beef, that’d be too heavy) or just serve it directly over rice or noodles. But try it with fish sometime! You’ll love it. 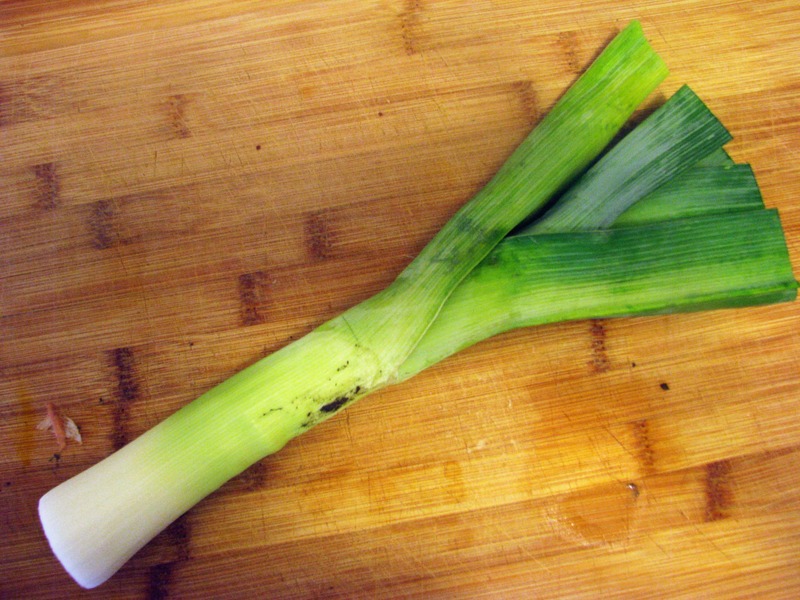 If you haven’t eaten leek before, it’s kind of like an extremely mild onion. 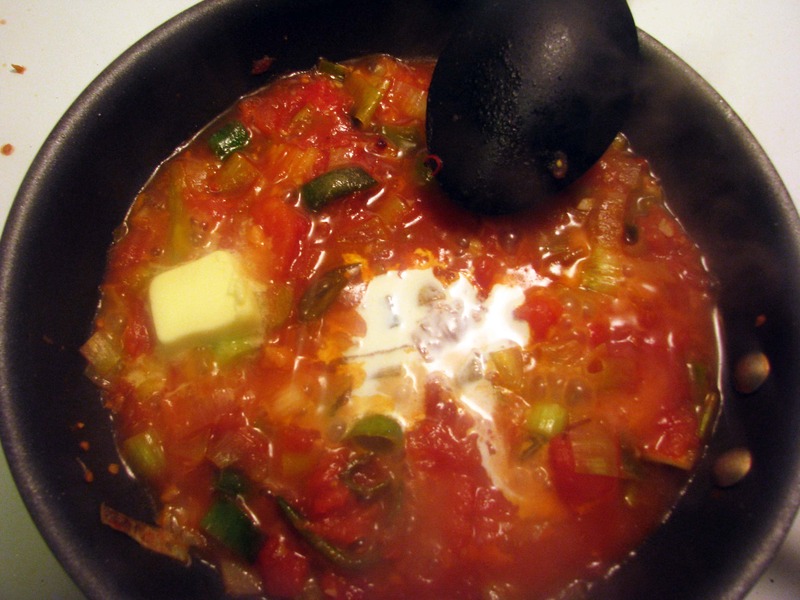 It cooks quickly and absorbs the flavors of whatever you cook it with. It’s very versatile and not too expensive. If you don’t have a leek or don’t feel like going to get one, you can easily substitute 1/2 cup chopped regular onion – no biggie! Leeks grow in layers through the ground, so in order to properly clean them you cut them first, THEN wash them from the inside out. Here’s how you get your leek ready? Cut off the root end and 1 inch of the tops - just the dry part. 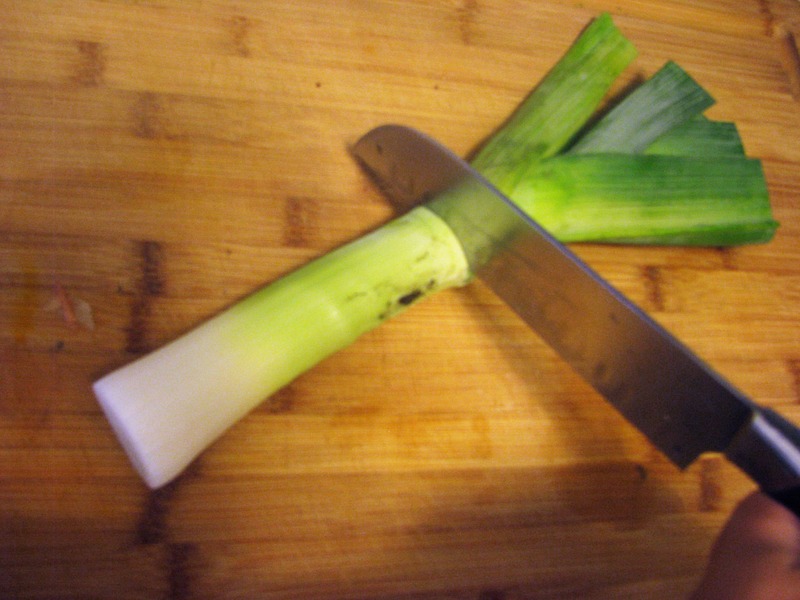 Then cut the leek in half. Then cut each half in half down the middle, and line them all up. If you photograph your food, please be sure to only take blurry pictures. Geez. 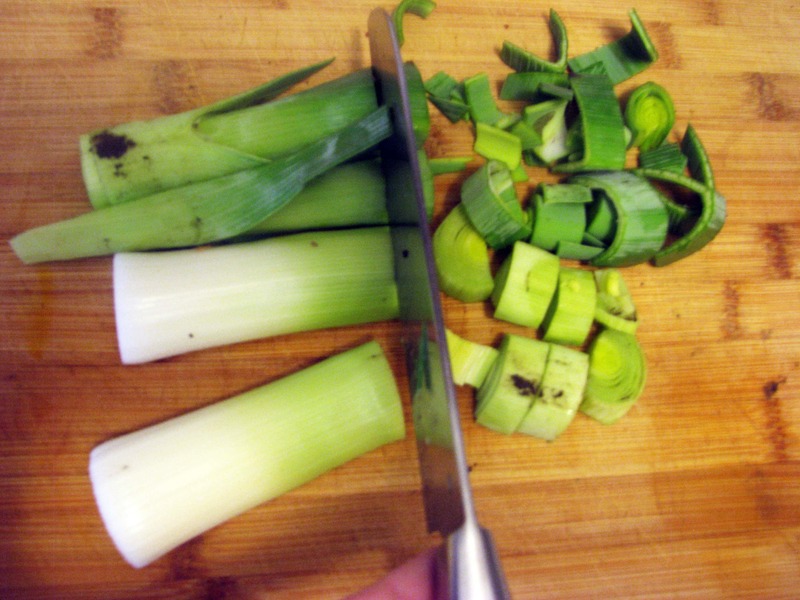 Then chop the leeks up into lots of half moons. See how dirty they are? Blegh. 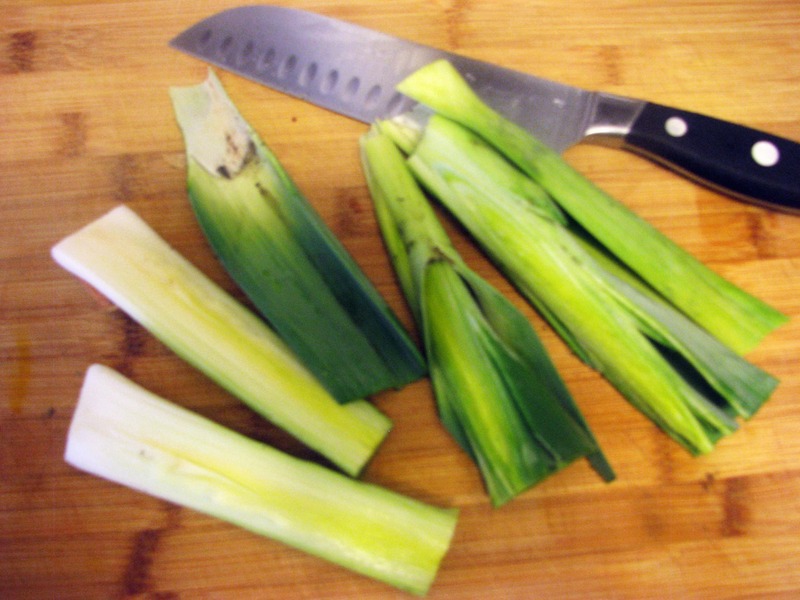 I’m not super into gritty food, so at this point put the leeks in a bowl and fill it up with water, then swish everything around for a good minute or so to loosen all the dirt. There should be lots of water below the leeks – they’ll float. Once you’ve performed your swishing maneuver, walk away. 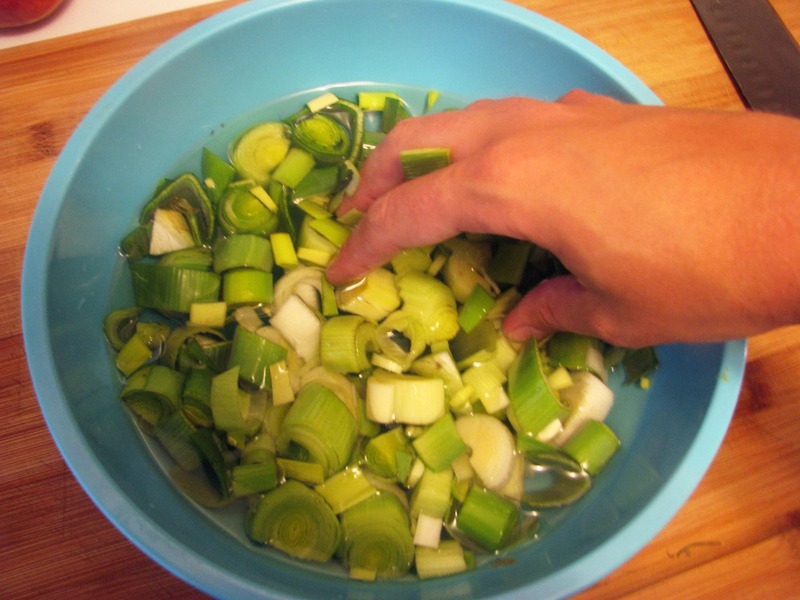 Let everything settle and the dirt will fall to the bottom of the bowl, leaving clean floating leeks at the top of the water. 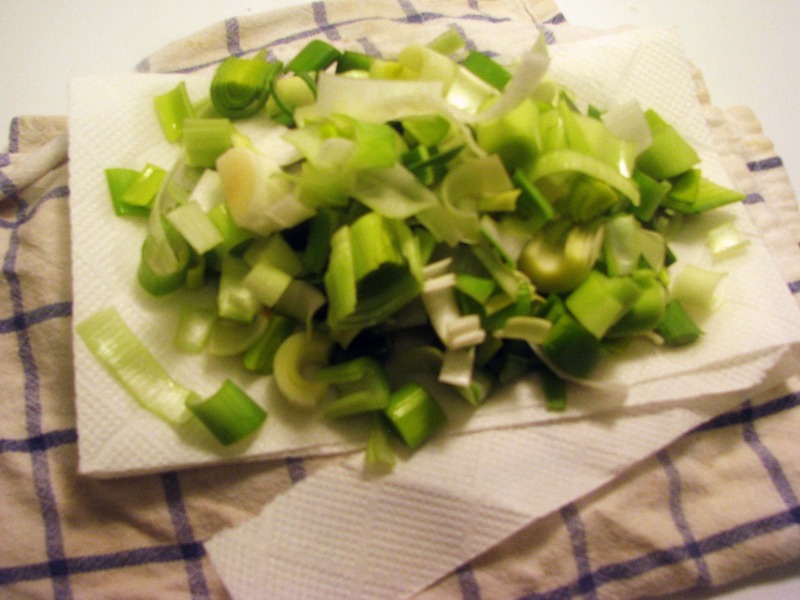 Take the leeks out with a slotted spoon or your hands (don’t disturb the bottom of the bowl), and let them drain on a dish towel or paper towels. While the leeks are draining, chop up something with spice. I used a dried Mexican chili sliced into thin rounds, but you could use a fresh jalapeno or fresno pepper OR 1/2 teaspoon crushed red pepper. It won’t make a bit of difference – just as long as you have something spicy in your sauce! 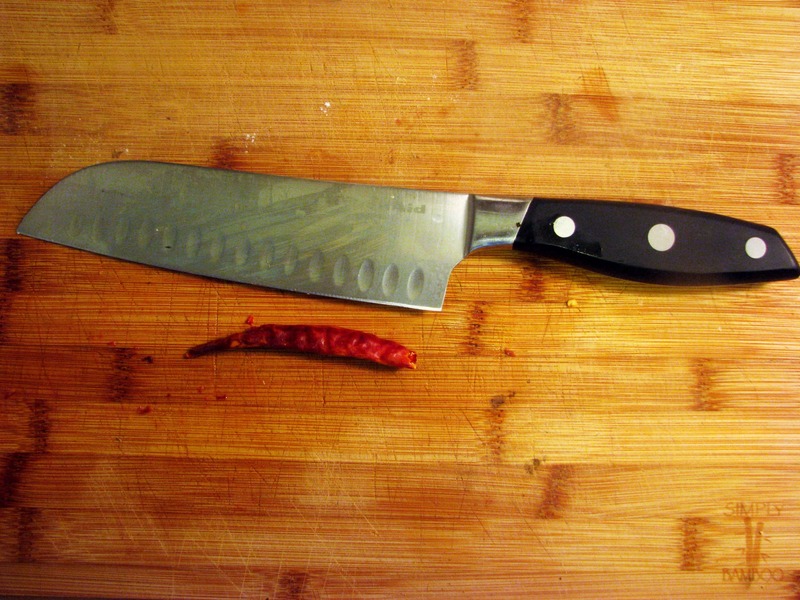 Obviously, if you don’t like spicy food, skip this step. 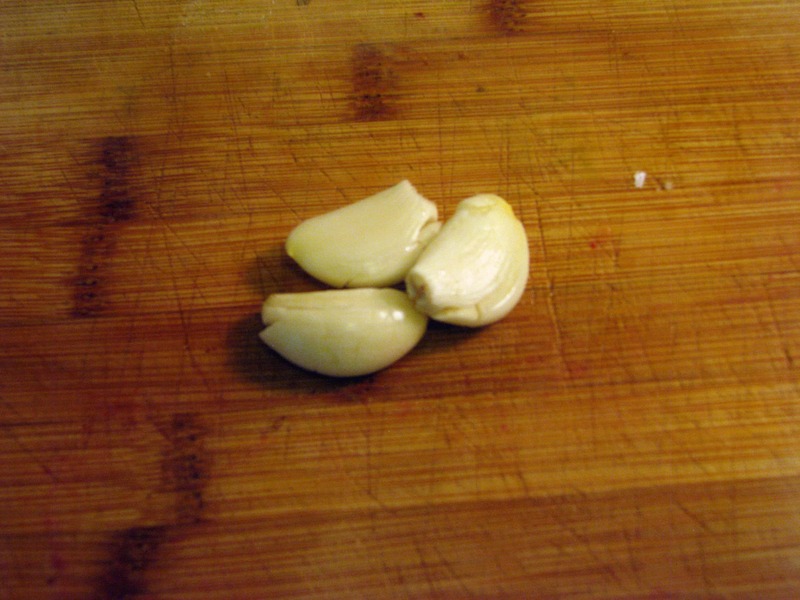 Now chop up some garlic. 3 cloves for 1/2 large can tomatoes for a sauce that will serve 2 or 3 is a good amount. 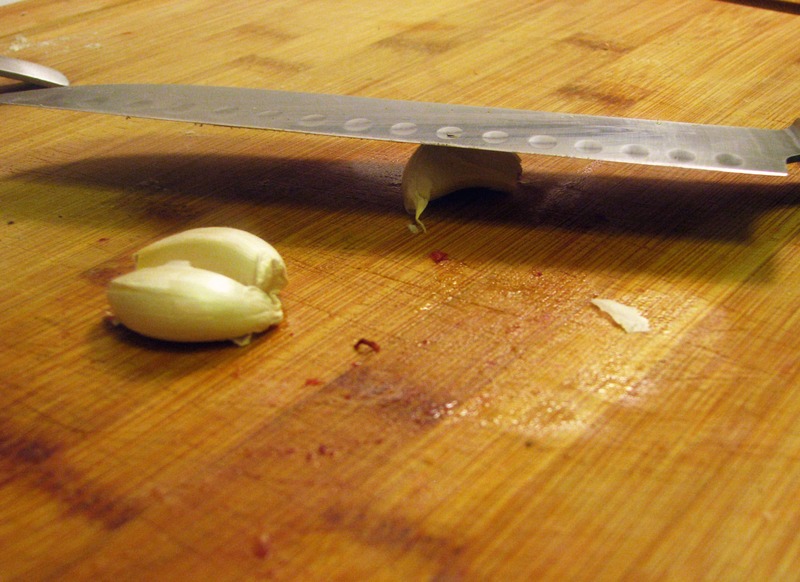 I start by whacking my garlic with the back of my knife and my fist to loosen the skins. Then I take off the skins…. 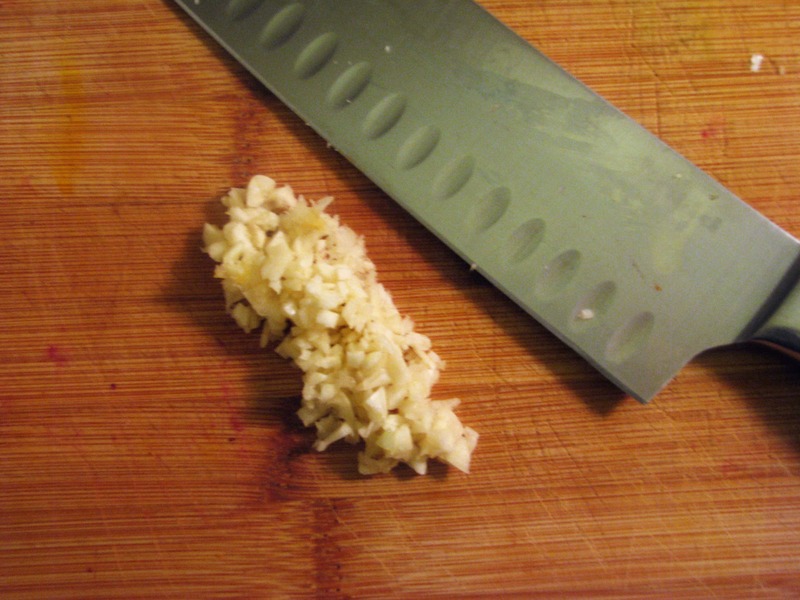 And then chop the garlic finely by running my knife over and over the garlic. You can press the garlic or grate it or whatever else makes you happy. It’ll taste good either way! So your leek is draining, your garlic and pepper are chopped. This is a good time to start some rice. Follow the instructions and go for it. Then, turn a big skillet to medium heat. 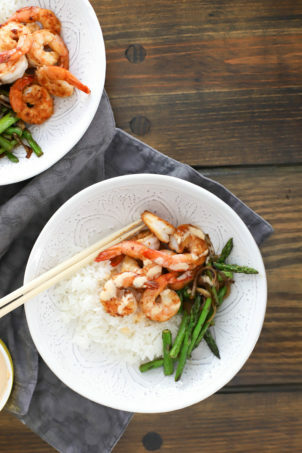 While the pan is heating up, get your fish ready. I like to lay (lie?) 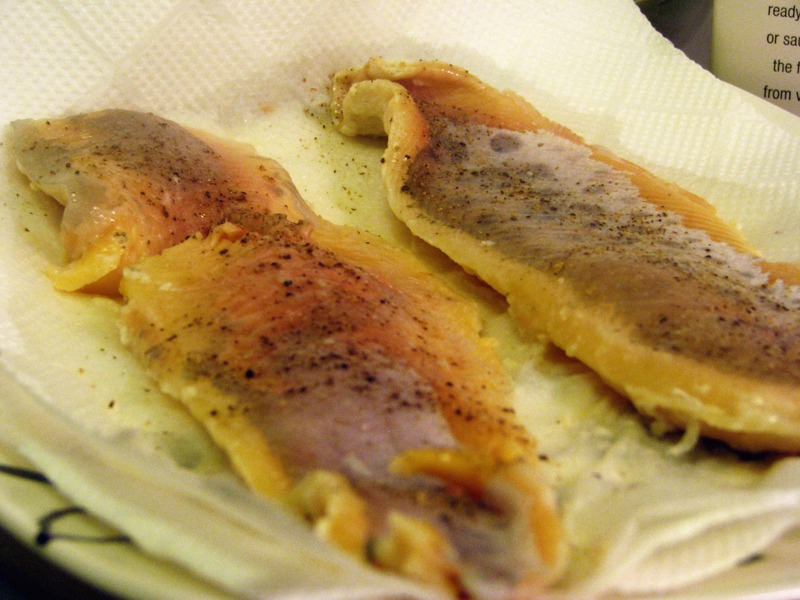 fish on paper towels to dry it off and sprinkle it with salt and pepper on the top. Then when I’m ready to cook it, I put the salt and peppered side down in the pan and salt the other side. Clever, huh? I didn’t think of it. 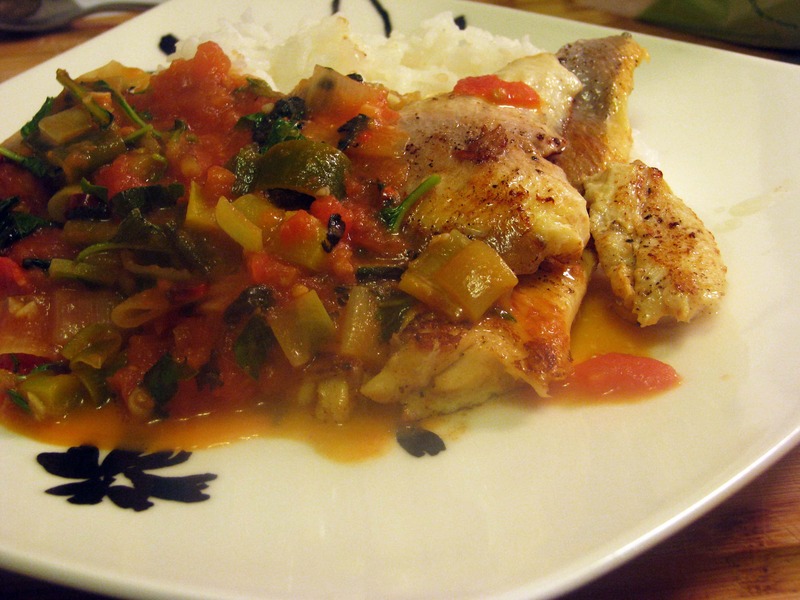 Once you’ve gotten your rice started and your fish prepared, your pan should be hot. 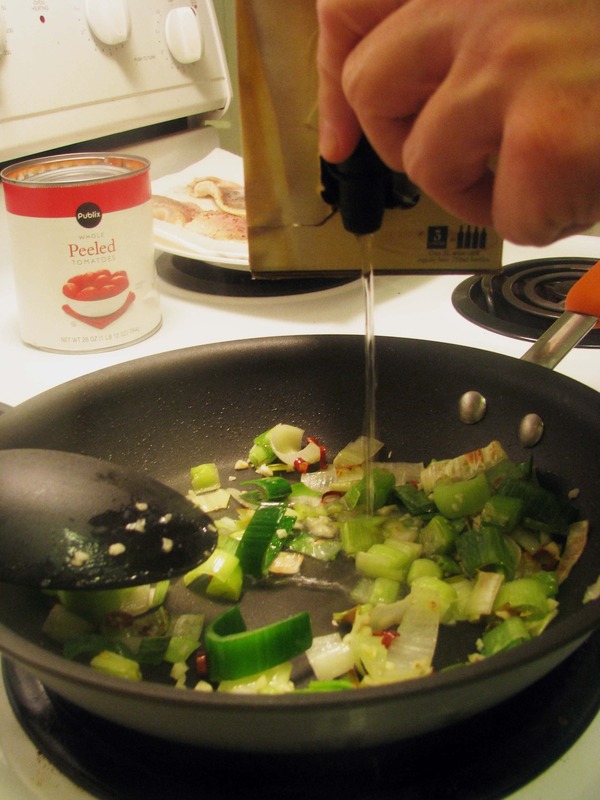 Add a tablespoon or two of olive oil, your chopped leek, hot pepper, and salt. No black pepper. Stir everything for two minutes. Or three. This picture is making up for the terrible ones at the beginning of this post. I like it. 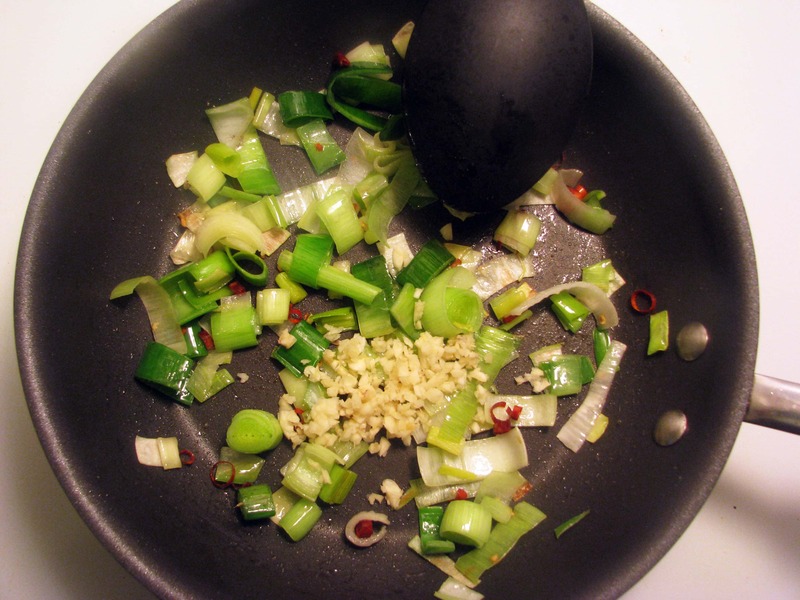 Stir this all together until you start to smell the garlic – it shouldn’t be brown, just fragrant. Then ask your boyfriend to pour about 1/2 cup boxed white wine into your sauce. 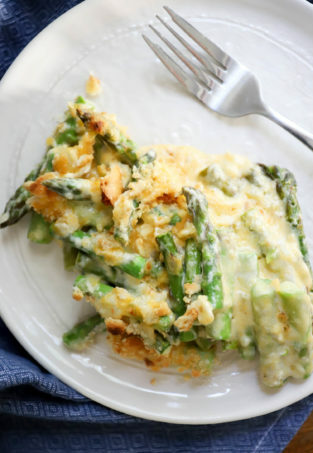 If you use crappy bottled wine it will only slightly decrease the quality of this dish. Stir the vegetables and wine for about a minute. 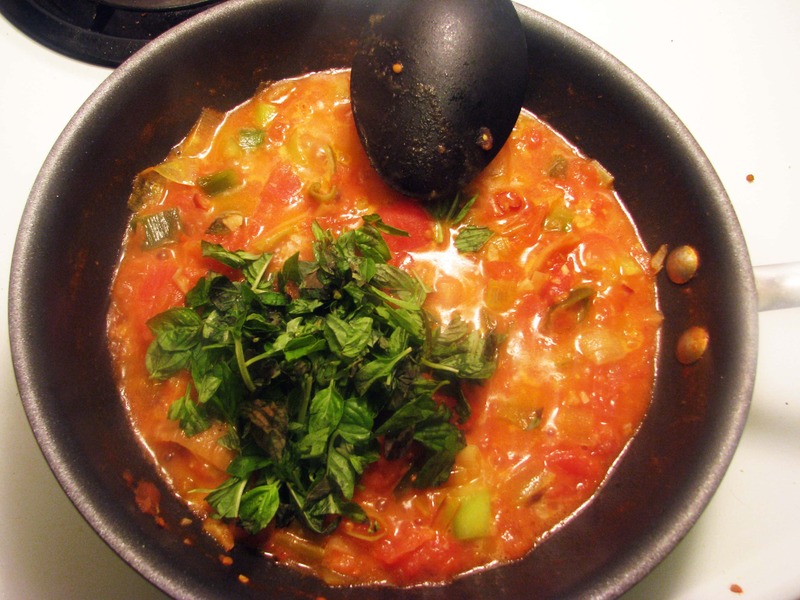 While the wine reduces, prepare to get a little messy with your tomatoes: I use whole peeled ones here because I can make some pieces big and some pieces small and the sauce is rustic and has great texture. 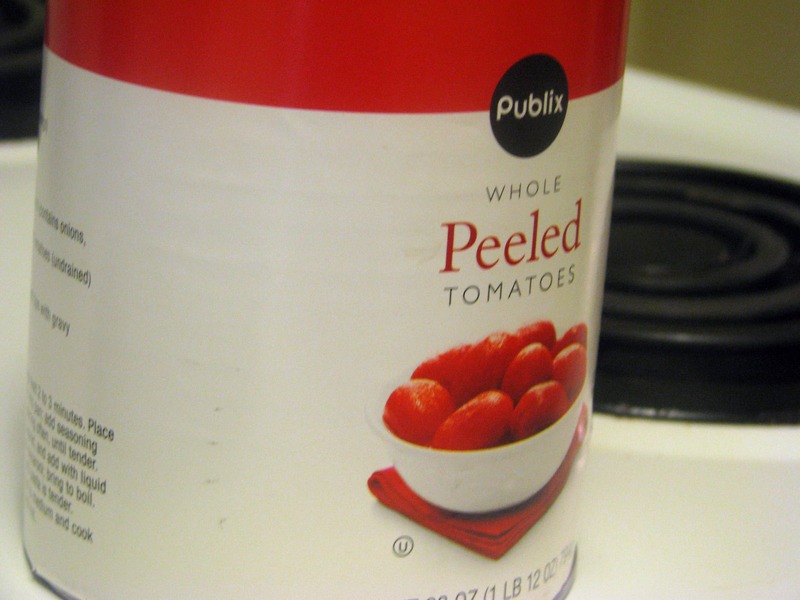 Open the can, pour HALF the juice into the sauce, and then break up HALF the tomatoes with your fingers. 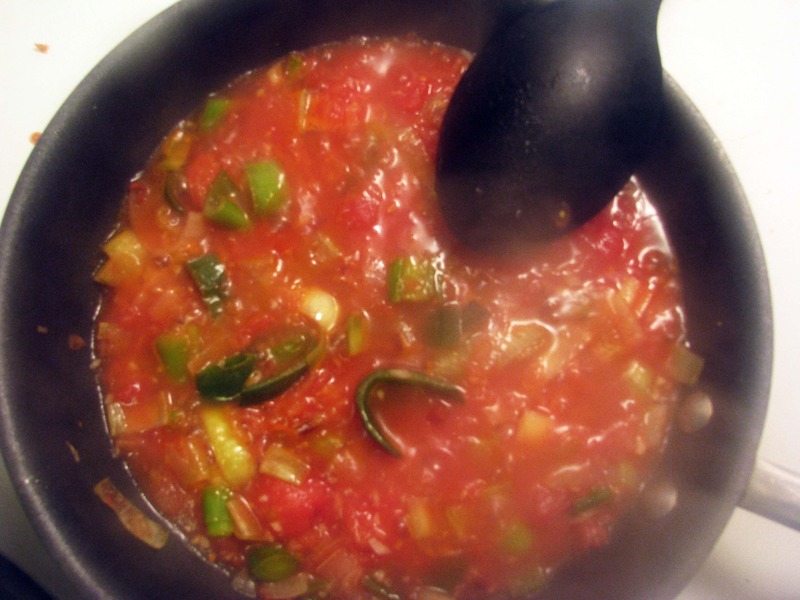 It takes a minute or two, but this allows the wine and tomato juice to reduce and the sauce to thicken. I have strange hands. I dated an emotionally abusive man once who made fun of them all the time to the point that I wore long sleeves that came all the way to my fingers. I didn’t realize at the time that I didn’t have much control over what my hands look like, but he should have been able to control his meanness. And then I dumped him. He was a picky eater, too, so it wouldn’t have lasted even if he had been nice. I’m picky that way. Anyways. 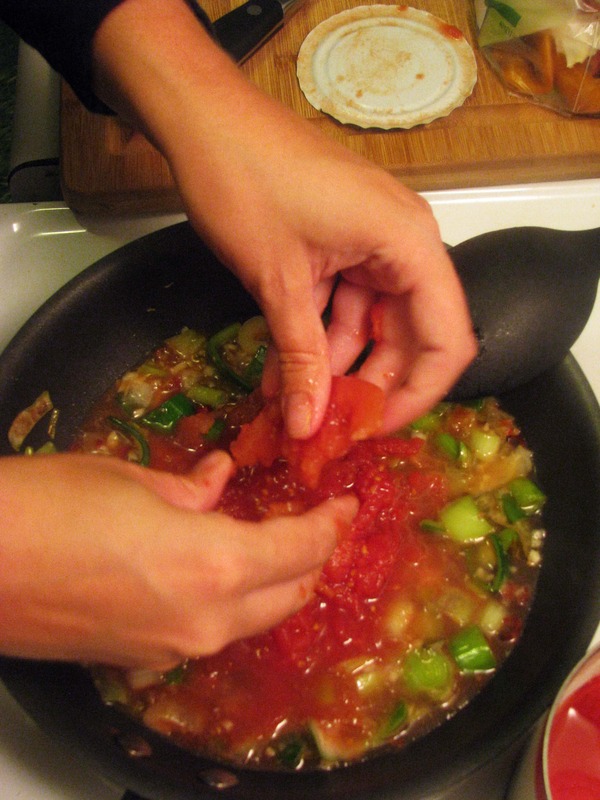 Crush the tomatoes, then stir everything around and let it bubble, but not full-on boil. Add another sprinkle of salt here too. This is really delicious. Go ahead and taste it now. Maybe add a sprinkle of salt or sugar, or some more spice (cayenne or crushed red pepper) if it isn’t hot enough for you. Then, because it’s so healthy…. Add some cream and butter! 2 tablespoons of each will be the perfect amount, or a little less if you’re watching your caloric intake. I’m watching my caloric intake increase each day…. Stir in the cream and butter, and while the sauce is coming back to a simmer tear 1/2 cup or so fresh basil and add that to the sauce. This is important: The second you put the basil in, before you stir it, TURN OFF THE SAUCE. 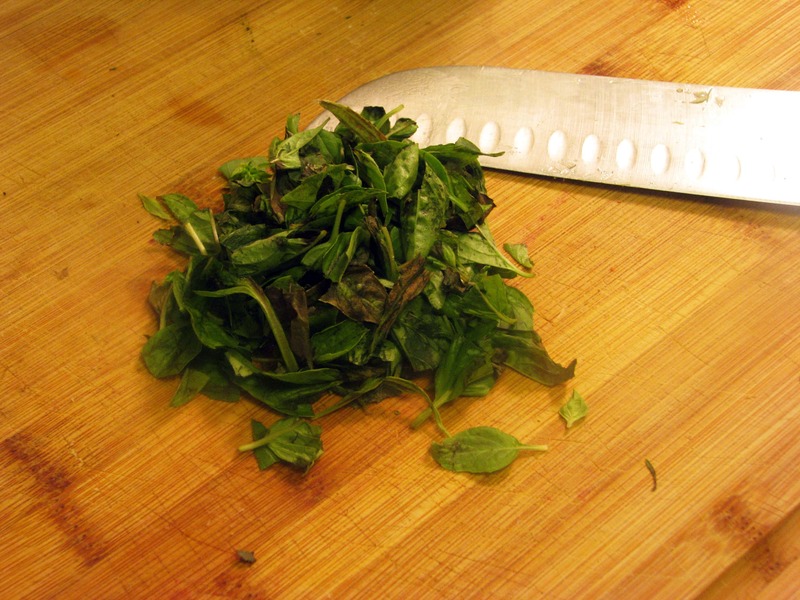 Otherwise the basil will wilt too much and cook and you won’t be able to taste it and you will have wasted 1/2 cup torn fresh basil. And that’s just dumb! 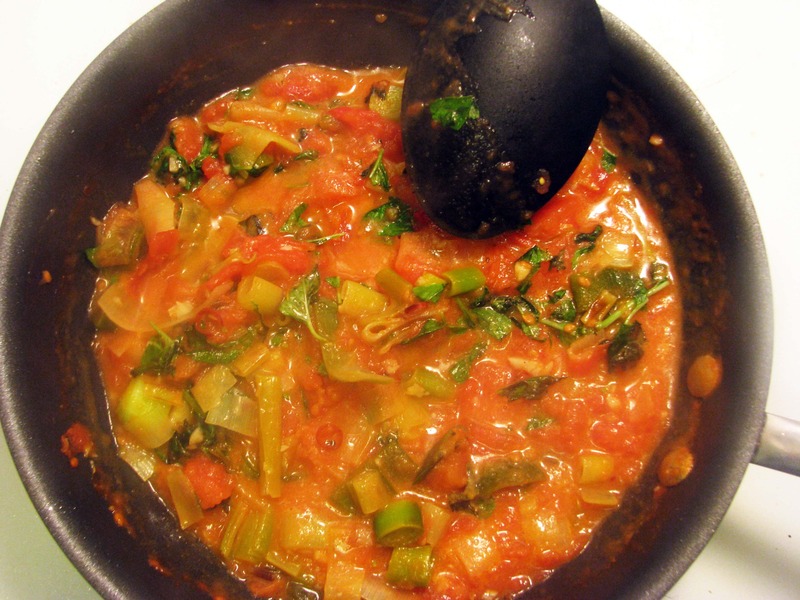 The tomato/wine/garlic/cream base for this sauce is just a canvas: you could add any veggies you like! Or…you could add bacon. Yep, that would be great. 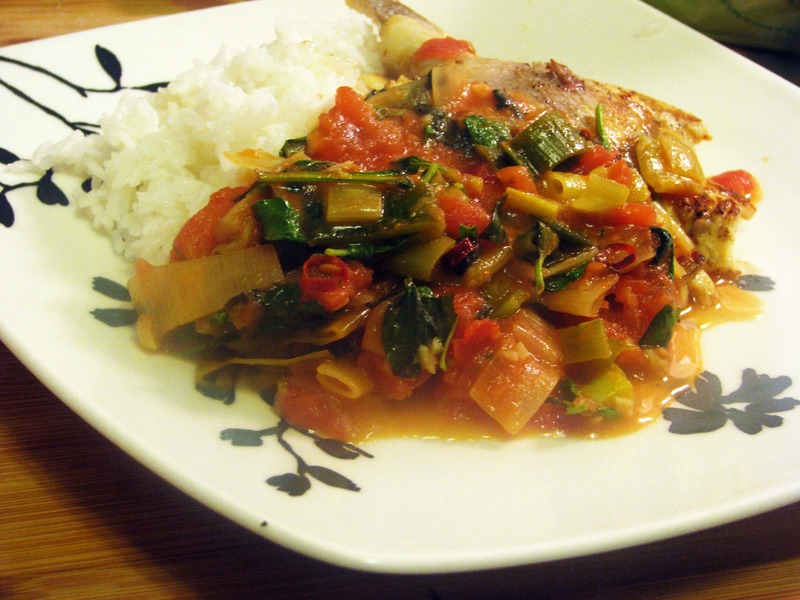 Serve this with grilled fish and rice and ENJOY. this looks delicious! i wish i werent working all weekend so i could make this for me and da boy. love you!! 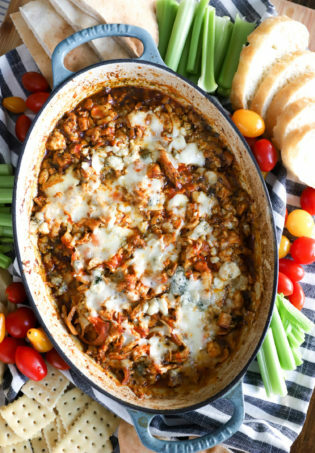 Make it soon and let me know how you like it, then come VISIT me and we’ll cook together! Love you!